Trulia's Rent Near Transit tool filters listings near subways and commuter train lines in Boston, Chicago, New York, Philadelphia, San Francisco and Washington D.C. Renters who take public transit in D.C. have an average one-way commute of 45 minutes. On the red line, Glenmont in Montgomery County, Maryland, is the least expensive at $1,637 per month, while Silver Spring inches toward the top of the budget at $1,952 per month. Trulia recently released an enhanced search method that for commuters looking to rent in major metros. The website’s Rent Near Transit tool filters listings near subways and commuter train lines in Boston, Chicago, New York, Philadelphia, San Francisco and Washington D.C.
At no. 10 on the list of transit-friendly cities, the share of D.C. train and bus commuters dropped 4.2 percent between 2010 and 2014, helping lessen congestion. Renters who take public transit in D.C. have an average one-way commute of 45 minutes. Although it might take a while, renting near the train cuts down on expenses. Where can you realistically rent within a 15-minute walk to the Metrorail? Take a look. On the Red Line, from Shady Grove to Glenmont, 10 stops post median rents under $2,000 per month. Glenmont in Montgomery County, Maryland, is the least expensive at $1,637 per month, while Silver Spring inches toward the top of the budget at $1,952 per month. The Green and Yellow lines run through Greenbelt ($1,925) and Prince Georges Plaza ($1,910). 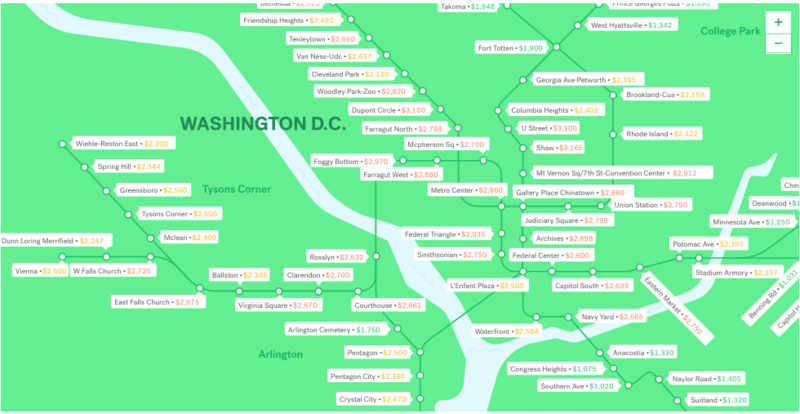 West Hyattsville, with a median rent of $1,342, features the least expensive costs among all of D.C.’s public transit train stops. Renters in West Hyattsville can access the Green and Yellow lines relatively easily. The Red, Green and Yellow lines pass through Fort Totten, where the median rent is $1,899 per month. If you want to take the Red line and can spend more, consider White Flint ($2,170), Friendship Heights ($2,475), Van Ness-UDC ($2,445), Cleveland Park ($2,170), Rhode Island ($2,450), Brookland-CUA ($2,261) or Forest Glen ($2,500). Georgia Avenue-Petworth and Columbia Heights are the mid-range stops for the Green and Yellow lines, at a median $2,366 and $2,400 per month, respectively. A total of 10 neighborhoods within walking distance of the D.C. Metrorail feature median rent above $2,500 per month. For Red Line commuters on the Maryland side, Medical Center costs $2,552 per month, while Bethesda is $2,610 per month. Within D.C. city limits, renters in Tenleytown ($2,655), Woodley Park-Zoo ($2,795) and Farragut North ($2,730) benefit from Red Line accessibility. The McPherson Square stop, where the Orange, Grey and Blue lines pass through, has a median rent of $2,700 per month. Three neighborhoods to catch the Green and Yellow lines cost more than $2,500 per month: College Park ($2,700), U Street ($3,100) and Shaw ($3,200). Unfortunately, there isn’t much correlation between lower rents and one definitive train line for D.C. commuters. The most expensive and least expensive areas are both on the Green and Yellow line routes, although costs increase within the city limits. 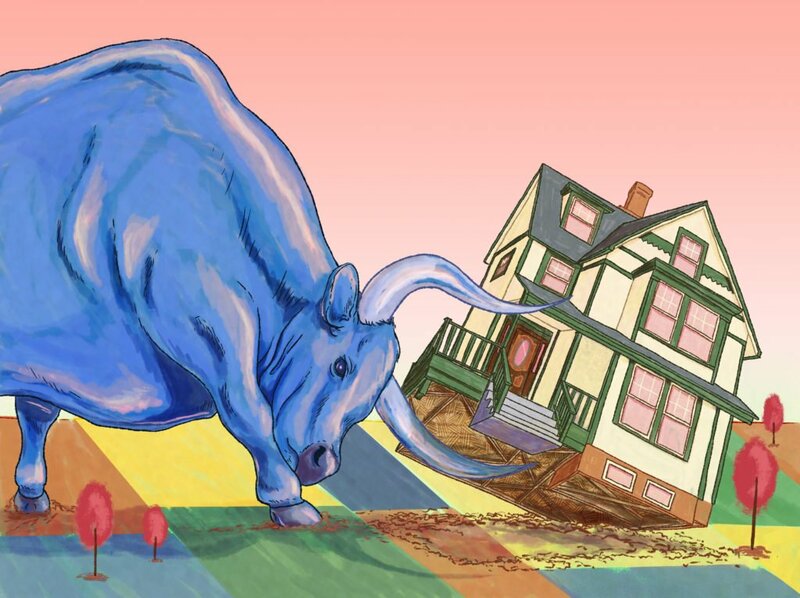 Jennifer Riner is a reporter for Inman who also writes on assignment for Trulia.